Webbrowser of een Office suite? Microsoft’s en Google’s productiviteitstoepassingen onder de loep. 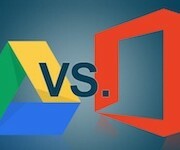 Office 365 and Google Apps are neck-and-neck in the ratings, but they’re completely different in real life. Google Apps is small and easily administered; it covers the high points; and it doesn’t try to reach into the more obscure corners of your company or organization. Office 365, on the other hand, offers the best (and most complex) enterprise support in the business. I’m continually amazed at how well Microsoft has built out Office 365, rolling feature upon feature into the mix, yet keeping the whole package remarkably stable, usable, and manageable. For large enterprises with strict data controls and complex, diverse operations, Office 365 has no equal. 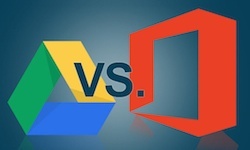 For any organization with less-stringent requirements and a willingness to part with companywide Office document compatibility, Google Apps offers a good, inexpensive, and reliable alternative. Lees de volledige review op Infoworld (Engelstalig).